“Work At Home United” by Lance Smith & Michelle Smith, found at workathomeunited.com, is a marketing company that represents Melaleuca, a company that sells health and cleansing products, and recruits marketers. Work At Home United has a low trust rating from online companies that do site checking. They are very vague about what the company does in the first couple of pages. 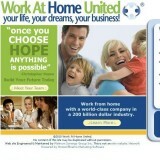 Work At Home United doesn’t say how much you will make or what you have to pay up front to join their program. They only release information when you provide your personal info on the opt-in page. Once in, they have your phone number, which they then call to get you to schedule an appointment for a conference call. It is nothing more than a half hour pre-recorded presentation about how to make money with “Work At Home United”. This pitch can be edited to explain everything much quicker, but they do this to lull you into submission, like hypnosis. This is a practice meant to bring you in and be convinced after so much repetition. The truth is that Work At Home United tries to sell you products from Melaleuca then get you to direct others to their site. Once on the site you get the others to buy the products too. This is supposedly how you make your money from commission on what they buy. In order to make any real income from Work At Home United you try to get hundreds of others to purchase hundreds of dollars worth of products. You have to do this nonstop if you are to earn a decent income. Their promotional gimmicks appear a bit deceitful and depend on how many others you refer. Their products are very expensive and not much different than those in the supermarket aisles. You now will ask yourself why you would have to advertise vague promos on Craigslist and other sites like it if the products can be found pretty much anywhere negating the need for any of this. It’s because you make money signing up more everyone you can for a program that is misrepresented and very difficult to get out of. It is not easy to quit Work At Home United after you realize it’s a scam. You will see a lot of sites that extol their virtues, but they’re mostly from people desperate to get you to sign up to buy the products and get more people to buy under them to make a buck. It’s a very hard thing to sell, and you have to sell to as many people as possible. Stay as far away from Work At Home United and the company they represent. I absolutely do not recommend “Work At Home United”.